President Donald Trump's ex-national security adviser, Michael Flynn, wants immunity to testify on alleged Russian election meddling, his lawyer says. Robert Kelner says his client "has a story to tell", but needs to guard against "unfair prosecution". Mr Trump said that Mr Flynn was right to ask for immunity, accusing Democrats of orchestrating a "witch hunt". Congress is investigating the allegations, with one senator warning of Kremlin "propaganda on steroids". Mr Flynn was sacked in February after misleading the White House about his conversations with a Russian envoy. His links to Russia are being scrutinised by the FBI and the House and Senate Intelligence Committees, as part of wider investigations into claims Moscow sought to help Donald Trump win the US presidential election, and into contacts between Russia and members of President Trump's campaign team. Representative Adam Schiff, the top Democrat on the House Intelligence Committee, called Mr Flynn's request for immunity a "grave and momentous step". He added in a statement that there was "still much work and many more witnesses and documents to obtain before any immunity request can be considered". Michael Flynn may have a "story to tell", but what it is at this point is anybody's guess. Donald Trump's critics will probably imagine grand revelations of possible campaign contacts with Russian operatives or even the "c" word - collusion. Beyond the news reports of ongoing conversations between Flynn's lawyer and federal investigators, however, there is no firm ground for such speculation. It's entirely possible the immunity request is nothing more than the former senior Trump adviser attempting to insulate himself from legal trouble if he were to answer detailed questions about his foreign contacts and lobbying efforts. For instance, if he actively represented overseas interests, he may have run afoul of federal disclosure rules. There's also the chance that Flynn could be uneasy about what he told FBI agents in January, when they asked about his conversations with Russian Ambassador Sergey Kislyak. Either of those possibilities would be of great concern to Flynn, who has a six-figure military pension to preserve, but it wouldn't be the kind of political bombshell that would directly threaten Mr Trump or his administration. Given the uncertainty of the situation, however, there's sure to be some sleepless nights ahead for the White House. Mr Flynn's attorney, Robert Kelner, said in a statement that his client "has a story to tell, and he very much wants to tell it, should the circumstances permit". He said he would not comment on his discussions with congressional panels conducting the investigation. The lawyer said the media was awash with "unfounded allegations, outrageous claims of treason, and vicious innuendo". "No reasonable person, who has the benefit of advice from counsel, would submit to questioning in such a highly politicized, witch-hunt environment without assurances against unfair prosecution," he said. Three other former Trump aides, former campaign chief Paul Manafort and former advisers Roger Stone and Carter Page, have offered to testify without requesting immunity. The Senate Intelligence Committee opened its hearing on Thursday with one member saying Moscow had sought to "hijack" the US election. Democrat Mark Warner said Russia may have used technology to spread disinformation, including fake news for voters in key states, such as Wisconsin, Michigan and Pennsylvania. 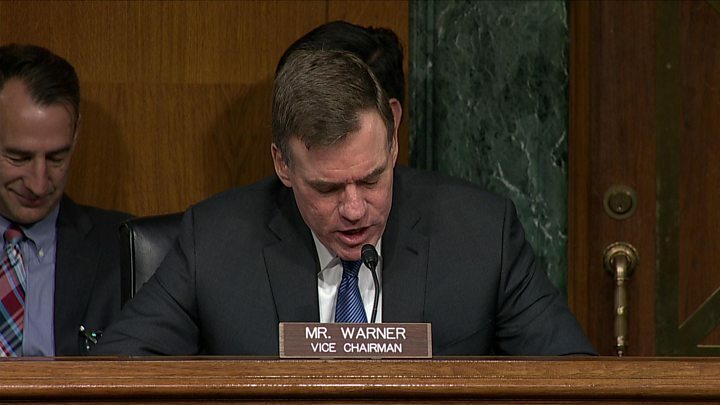 "This Russian 'propaganda on steroids' was designed to poison the national conversation in America," Senator Warner said. Panel chairman Richard Burr, a Republican, warned: "We are all targets of a sophisticated and capable adversary." Image caption Russian President Putin has again dismissed the US claims as "nonsense"
Mr Burr also confirmed there had been "conversations" about interviewing Mr Flynn, but his appearance had not been confirmed. The Trump presidency has faced continued allegations that members of its team colluded with Russian officials during the election campaign. The president regularly dismisses the claims as "fake news" and Russia has also ridiculed the allegations. President Putin did so again on Thursday at an Arctic forum, describing them as "nonsense" and "irresponsible". 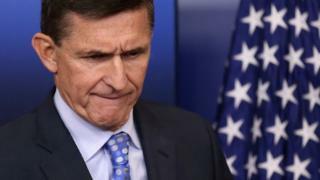 Mr Flynn, a retired army lieutenant-general, initially denied having discussed US sanctions against Russia with the country's ambassador, Sergei Kislyak. But he stood down after details of his phone call emerged, along with reports that the Department of Justice had warned the White House about Mr Flynn misleading officials and being vulnerable to Russian blackmail. At last summer's Republican party convention, Mr Flynn led chants of "lock her up" aimed at Hillary Clinton over her use of a private email server. In September, he said in a TV interview that it was unacceptable that some of the Democratic candidate's aides had been granted immunity from prosecution. "When you get given immunity that means you've probably committed a crime," he told NBC News.